News about New Matadi Salesian Presence . In February 1989, Sean Devereux, a volunteer from UK arrived in Monrovia. It was not realized at this time, the effect Sean’s hard work and dedication would have on the people of Liberia, especially the children. In August 1991, “the land, in Matadi, to be used for a Youth Centre was finally acquired and became operational the following month. When Bro. Blamoh Harris (the first Liberian Salesian, at that time is was following the philosophy post profession formation) arrived back in Monrovia he joined Bro Joe Glakin (a salesian from Scotland, which was concluding the Theological studies before to be ordained priest) at the newly formed Matadi Youth Center. On 25th September the Salesians of Don Bosco established the Don Bosco Youth Centre, venue for youth development, reconciliation and rehabilitation, home to cater to youths of the nearby communities of Lakpazee, Fiamah, New Matadi, Old Matadi, Airfield and other adjacent areas of Monrovia. The early days the salesian had a small dorm and young people confused from the war. After his ordination, in 1992, that took place in his town, Joe Glakin returned to Matadi to continue his excellent work, assisted later in the year by Fr Chris Heaps. Bro Ondrey Fischer, from the Chech Republic also joined them. Ged Naughton, a volunteer from England also worked hard at the Youth Centre, in this period, but almost one year had to left because the rebels treated seriously the life (five American sister of the Precious Blood were killed by the rebel in October 1992. A very small group of Catholics from the neighbourhood began joining in with the Mass there instead of going to St. Joseph’s. Mass was in the large building surrounded by a park. After a time they chose the name Holy Innocents in remembrance of the many young people killed and hurt during the war. Baptism classes began but they went to St. Joseph’s to be initiated and enrolled in St. Joseph’s baptismal register. Baptism classes began but they went to St. Joseph’s to be initiated and enrolled in St. Joseph’s baptismal register. Bro Ondrey Fischer was following the constructions. Don Bosco Homes aims to reach and support and empower young people in difficult circumstances, to restore self-esteem and encourage them to take place in society as independent responsible citizens. The principal target group are boys and girls aged between 9 and 17 years who are displaced, abandoned, living or working on the streets, or with serious family problems. In August, the first Liberian Salesian, Blamoh Harris, made his final profession and left Liberia once more, to continue his studies in Nairobi – Kenya. The Salesians in Don Bosco Sean Devereux Youth Center are part of the Community in 8th Street but the activity is now enter under the Central Office of the Don Bosco Programs set up to unite Don Bosco Homes (DBH), Don Bosco Rehabilitation & Skills Training (DBRST), Don Bosco Youth Centre - Matadi (DBYC), Don Bosco Polytechnic (DBP). Active part of these programs has been Fr. John Thompson who has been in Liberia up to the end of 1996. The Don Bosco Oratory is named Don Bosco Sean Devereux Youth Centre. Some facilities at the Youth Centre are built up. By March 1994 the foundation for the Don Bosco Rehab Programme began. Workshops and classrooms were built for welding, electrical, plumbing, building and auto mechanics. Misereor from Germany supplied all the funding. Fr. John Thompson who has been in liberia up to the end of 1996 was also part in these programs. In August a group of business men and women, among them Fr Joe Brown, met with the Liberia National Transitional Government. They discussed the Liberia Fund for disarmament, whereby they would be able to buy weapons and destroy them publicly. They received the full support of the transitional government, and obtained over US$10,000.00 from business community, but were eventually stopped by ECOMOG, because the weapons had to be given to the incoming government. The money was then divided among the non-government relief agencies. Bro Ondrey Fischer left on July 1994, returning in Prague, after two fruitful years of Salesian work in Liberia. Facilities in Matadi are left completed by Brother before returning in his province. For the feast of Don Bosco 31st January 1995 was celebrated with the excellent background music offered by Don Bosco Beat Band from don Bosco Homes. A few weeks later took place the inauguration of the extension of the Don Bosco Rehab Program, which was supported by Misereor. Two voluntaries, Fred Toomey from America and Fred Guyot from Germany, help for about one year in the skills training programme, which Br Donald MacDonald started. Early in the morning, on 1st March 1995, the Consolata Sisters near the Youth Centre in Matadi, contacted Fr Brown by radio handset. Armed robbers had broken into their residence. They had smashed down four doors and hit Sr. Giovanna, knocking out some teeth. Fr Joe Brown, who had a curfew pass, went to rescue the Sisters by car, shining headlights on the building in the complete darkness, and managing to scare the intruders away. He then took the Sisters to hospital for treatment. In 1995 Don Bosco also opened the ‘Monte Carlo Girls Training Center’ in Broad Street. The program was designed to cater for vulnerable socially disadvantaged street girls in and around Monrovia, who could not afford to continue regular academic school and were with faced with socio-economic problems. They were offered training in pastry, sewing, hairdressing, literacy, small business and health education. On Easter Sunday, 6th April 1996 at 3:40 am, the capital Monrovia was stormed by rebel forces. Waves of fighters, many of them children, were clearing people out of their homes, looting shops and supermarkets. All foreign nationals were advised to leave. Thirty eight Sisters, Priests, (among them Fr. Chris Heaps and Fr. Jose Valiplackel, an Indian Salesian who had arrived in February, and the voluntary Fred Toomey), left by helicopter from US Embassy to Freetown. Fr Brian Jerstice, the Rector was asked to return to UK to discuss the situation. By June 1996 the number of missionaries in the country was down to twelve. Only three Salesians remained in Liberia Frs. Joe Glackin, Joe Brown and Larry Gilmore. In 1997 Salesian involved in taking care mostly of the former child soldiers in the Don Bosco Rehab & Skills Training Program. Under the direction of Fr. Joe Glackin great contribution was given to the Archdiocesan youth apostolate, in school retreats, workshops, training of catechists and catechumens etc. At a point the Salesians were running 6 parishes! In March, on Palm Sunday, His Grace Michael Francis blessed ‘Sean Devereux Youth Center’ in Don Bosco New Matadi. Also, footballer George Oppong Weah, who had been voted FIFA player of the year 1995, and was now UNICEF Goodwill Ambassador, attended the large public programme at the former American Cooperative School (ACS). He was entertained by the Don Bosco Homes with the music provided by the Bosco Beat Band. It was a very proud moment for all concerned when he described in public, how he had his car repaired by the Don Bosco Rehab Program. In 1997, Archbishop Michael Francis engaged Mr. Benz to construct the Church building because the congregation was now quite large and was using the outdoor hall for Mass. In May 1997, Blamoh Harris became the first Liberian Salesian to be ordained priest on Pentecostal Sunday. Fr. Blamoh started to reside in Don Bosco New Matadi acting as Parish Priest of HIP even though the canonical erection of the Parish has been issued only on year 2000. In 1997 was the reactivation of the Christian Foundation for Children and Aging (CFCA) scholarship program with 37 beneficiaries this year. In August 1997, the first group of Salesian Co-operators made their promise. Joe Wiah and Bartholomew Wreh left for the pre-noviatiate in Nigeria, Bro. David Konneh left for Tanzania to continue his salesian studies as salesian. Also Confort Davis and Jacqueline George left Liberia travelled to Ivory Cost, interested in becoming Salesian Sisters. Fr. Joe Brown helped to erect the new short wave Catholic radio station, Radio Veritas. A decision was made to reopen the don Bosco Polytechnic that was closed since 1990. Fr. Joe Glackin became rector of 8th Street as Fr. Brian Justice ended his 8 years in Liberia . The year ended with the dedication of the national shrine of our Lady Queen of Peace, at Virginia. A memorable event in the year 1998 was the ‘Salesian Family Parade’ organized by the Salesian Cooperators for the feast of Mary Help of Christians. This included a march through the streets from 8th Street to the Holy Innocent Parish Matadi. Fr Chris Heaps returned to Monrovia especially to support the work being done in the Don Bosco Homes. Frs. Blamoh and Fr. Larry Gilmore were making considerable progress with aspirants in Matadi at the Youth Center. In April 1998 the mini skills training program for the purpose of empowering young people was introduced in Sean Devereux Don Bosco Youth Centre with emphasis on sewing and typing, Was introduced also the cultural troupe intended to constantly remind youngsters on the aspects of Liberian cultural practices. Additionally there is an academic program by which the Centre pays fees and tuition for some needy students in various schools in Monrovia and Tappita. By Christmas the first issue of the magazine ‘Don Bosco Link’ was published. This excellent magazine was edited by John T. Monibah and focused on the many Don Bosco programmes in Liberia. In 1999, Holy Innocents’ Parish is canonically erected as Parish. Fr. Harry O’Brien who had been parish priest in St. Joseph’s parish for 16 years, moved to the Youth Centre in Matadi. Mr Michael Sowah is assigned as Cathechist to Holy Innoents Parish. Fr. Francis Preston the UK Provincial and Fr. Gerry O’Shaughnessy, paid a 10 days visit at the end of January 2000, culminating in the parade by about 500 from the various Don Bosco programmes to mark Don Bosco’s Day, from Don Bosco Polytechnic to the Youth Centre Matadi. This was followed two days later by a candlelight dinner dance at Matadi for about 150 members o the staff and their partners. Fr Harry O’Brien was asked to be Vicar General of the Archdiocese of Monrovia. Fr Joe Brown, after more than 20 years in Liberia returned to UK to set up a mission office in London to support the work of the Salesians mainly in Liberia. The DBYC provides a wide range of activities including vocational education, recreation, academic assistance, counselling, and youth retreats. Professional courses are organized to acquire marketable skills in tailoring and clerk typing. Target groups include: Youth people interested in vocational training, school drops outs, youths who wish to acquire basic skills in reading and writing, Youths involved in sports and recreation, Illiterate adults wishing to acquire reading and writing skills in order to be able to assist in tutoring their kindergarten school-going children. The year started on a very sad note. Bro. Bartholomew Weah died tragically in a motor accident on 14th January at the very young age of 27. Fr. Blamoh travelled to US to attend the first session of an on-going MA course in Youth Ministry at Boston College. By the end of July 2001, because of the many movements, there was only Fr. Joe Glackin and Fr. Jose Valiplackel at 8th Street, Fr Larry at Matadi and Fr. Harry at the Cathedral. A workshop on Children protection and rights promotion was organized from 23rd- 28th July by Paul Najue (a past pupil of Don Bosco Polytechnic), director of Don Bosco Homes, for 280 Security Personnel and after for the Armed forces of Liberia,. Towards the end of the year, Fr Joe Glackin , the Rector was very ill, he had to return to UK for specialist treatments and Fr. Jim McGarry came from UK to asset the situation. The CFCA programme, started by Fr. Chris Heaps and Fr. Joe Glackin in 1989 was now being run by John Rufus Ballah, and sponsored 995 regular students in nineteen Catholic and Community schools in Monserrado, Bomi, Margobo and bass County. The Don Bosco Rehab and Skills Training Program was wound up at the beginning of the year, due to financial problems. The property was taken over by the Archdiocese, which established a Production Centre. The Don Bosco Homes had now taken the lead to identifying children’s rights and protection issue. Thirty-three months after the Government of Liberia placed 70 children in the custody of Don Bosco Homes, they were reunited with their parents. For two months from 6th June 2003 the capital was under siege by the rebel group LURD, their aim being to over through the president. During this time all the Don Bosco programmes did what they could to continue, taking in all those who sought refuge and who needed to be fed. Also Fr Larry Gilmore and the Don Bosco Youth Centre Projects coordinator Aloysius Klon had about 150 displaced people in the Youth Centre at Matadi. On the initiative of Fr Blamoh, with the promotion and the support of the HIP, in 17th November 2003, a new primary school (k1 to Grade 3) dedicated to Mary Help of Christians was opened in Matadi. Two ground floor buildings with some classes and offices for MHCCS lessons are arranged. The aim of the school is to provide a firm, solid elementary foundation to enable the children to enrol and cope in other institutions. Later in the year outstanding support came from CAFOD who described Don Bosco Homes as the only organization welcoming former child soldiers. The DBYC envisioned the need to operate a mini-skills program in carpentry, brick-making, soap making, typing and sewing, and adult literacy courses of 18 months. Among the instructors is Mr. Evans Stevenson, Mr. Brooks, Mr. Gray, Mr. Klon. Between late March and Early April, the Don Bosco Youth Centre was blessed to have been visited by five senior Salesian priests: FR. Valentin De Pablo Coucelor of the General Salesian chapter, for the Africa Region, Fr Francis Preston the Provincial Father of British and Liberian Province; Fr. Jim McGarry councillor of the Salesian Province, Fr. Mervyn Williams Economer of the Salesian Province, Fr Riccardo Castellino delegate of the English-Speaking West Africa delegation. The year 2004, the Rector Major Fr. Pasqual Chavez Villanueva canonically erected the new Salesian Vice Province of English Speaking West Africa (AFW) that included Ghana, Nigeria, Sierra Leon, Liberia. In January, the footballer George Weah returned for a four day visit. The highlight of this visit was a celebration for 100 demolished child soldiers, at a centre run by the Don Bosco Homes in Virginia. This event had worldwide publicity. The feast of Don Bosco was celebrated befittingly with the presence of the Archbishop Michael Francis at holy Innocents’ Parish. The homily was given by Fr. Ivor Netto from London who had arrived ten days previously. On 1st July 2004, Fr. Chukwudi Akubueze, a newly ordained Nigerian Salesian sent by Fr Riccardo Castellino Provincial Father of the new formed AFW, arrived. He gave new impetus to the Don Bosco Sean Devereux Youth Centre in Matadi. With the arrival of Fr Chukwudi Akubueze, Fr Blamoh left Liberia to be Rector of San Francis Community in Ashaiman Ghana. Fr. Lawrence Gilmore became Principal of MHCCS, Parish Priest of Holy Innocents’ Parish, in charge of the Salesians residing in Matadi. On 4th August, among the 16 Salesian Novices who made their first profession were two Liberians: Sunday Williams and Albert Gibson who make the difficult journey during the civil disturbances. The Rector Major Fr. Pasqual Chavez visited Liberia Salesian presences from 19th to 21st November 2004. The DBYC Cultural troupe danced and sang traditional songs. On the second day Fr Chavez visited the community of Matadi, home of the ever lively Don Bosco Youth Centre. He was given a white chicken – symbolising peace and purity of hearth towards him while in Liberia. He was also given the key of Matadi community as another sign of welcome. From the welcome site they marched to DBYC’s gates with colourful T-shirts, printed for the occasion. A Mass, concelebrated by 9 priests, followed. A gift that came with the visit of the Rector Major was his donation of a good amount to start a new building of 8 classrooms and offices for Mary Help of Christians Catholic School children in Matadi. The Salesians accommodated in New Matadi are now Fr. Chukwudi Akubuese, and Fr Larry as Parish Priest of HIP and Principal of MHCCS. Catechist of HIP is Mr. Michael Sowah. In late July 2005, Carlos De Carcer of Red Deporte Y Cooperacion (RDC) expressed the RDC’s desire to work with Sean Devereux Don Bosco Youth Centre in Matadi Monrovia. After consultation with the Provincial Fr. Castellino Riccardo and the Rector Fr. Harry O’ Brien it was accepted. In 2016 Deacon Fidelis Agbara joined the Salesians working in New Matadi taking the tasks left by Fr Chukwudi. A memorable visit took place: the mother of Sean Devereux, Mrs. Maureen Devereux, Sally Hounsham and Fr. Joe Brown arrived in Liberia in late January to participate at first memorial event marking what Liberians now call the yearly “Sean Devereux Day”. The Sean Devereux-Don Bosco youth Centre Matadi marching band backed the carnival-like procession through the Monrovia streets. A Computer Village, to develop the human resources of youth in and around Matadi is established at Sean Devereux Don Bosco Youth Centre. It was running five class session daily, using 16 computers with 41 students and operating in a cosy air condition room under the supervision of the Youths Director Rev. Fr. Chukwudi Akubueze. On August 2006 Fr. Chuks Akubueze leaves Liberia and moves to Sunyani Ghana, to be Socio in the Novitiate of AFW Province. He left a lot of programmes, in town, and in New Matadi: Don Bosco Computer Village, Youth Centre Library, Salesian Youth Movement SYM (comprising 19 active youth groups), New Matadi Shrine, Hill of Oratory, Model of youthful Beatitudes, Oratory Studio and Communication, etc. . . The Catholic Church in Liberia turned 100 years old in October 2006 and thanks to myriads of missionaries and lay collaborators, the Church is found in most parts of the country positively responding to the spiritual, social, and humanitarian needs of the people. The SDB has reached seven of Liberia’s 15 countries including Moserrado, Bomi, Margibi, Grand Bassa, Bong, Nimba, and Grand Gedeh. Together with corps of Liberian co-workers, they have assisted scores of needy people and empowered others through academic, vocational, and tertiary education. Some SDB institutions are Don Bosco Homes, Sean Devereux Don Bosco Youth Centre, Don Bosco Technical Elementary and High School, and Mary Help of Christians Elementary School. They also administer Holy Innocents and St. Joseph’s Parishes. The erstwhile Don Bosco Rehab and Skills Training Program, St. Francis High and Parish in Nimba County, and the renamed Don Bosco Polytechnic were also administered by the SDB. A walk, indoor program, and outdoor sports characterised the Sean Devereux’s Day celebration. Fr. Joe Brown and Mr. Mc Grory came from England. On the 5th January they went all around in Monrovia to distribute more than 1000 SD t-shirts to the participant and different groups. On 6th January the march started with about one thousand persons from 8th Street. It took a few hours to get Sean Devereux-DBYC New Matadi. At the arrival the participants met various guests. Speaker was Mr Joseph N. Y. Tucker, a man who knew Sean Deverux very well, and worked and travelled with him to many parts of Liberia. The year 2008 saw the Deacon Agabara Fidelis going to Nigeria Akure, to be ordained Priest, before to come back and continue to take the task of youths in charge. With a numerous group of animators and youths of Liberia he participated to the AFW Youth Forum in Ghana. As they were going by road, the driver lost the control of the bus and everybody finished inside a bush ... miraculously no one got serious injure. Because of the not strong health, Fr Fidelis Agbara moved to 8th Street Community in accommodation, Fr. Matthew Udoka is assigned to New Matadi as in charge of Youths but can arrive only in the early months of 2010. In August 2009 arrive in Matadi as Second Year Practical Trainee Solomon Gbaki, a salesian vocation of Sierra Leon. On December 2009 the Architect Robert A. Gray prepares a new bill of Quantity to take the abandoned project and continue the works. This time the construction of the building is awarded to Liberia-China United Investment Croup (LCUIG). Fr. Matthew Udoka arrives in March 2010 and takes the task of Director of the Sean Devereux Don Bosco Youth Centre. Main Collaborators of the Salesians are chosen Mr. Abel Obarakpor as vice-chairman of Holy Innocent Paris and Mr. Otello S. Williams as Vice Principal of Mary Help of Christians Catholic School. The new Construction Company also fails to continue the works as they make the columns after casting the second floor. The group of salesians residing in Matadi doesn’t change: Fr Larry Gilmore (Salesian Presence in charge, HIP Parish Priest, Principal of MHCCS), Fr. Matthew Udoka (DBYC in Charge) , from July 2010 the Trainee Salesian Student Josephat Ike Nwugo joins the group of Salesians living in Matadi. Youth meeting in Sierra Leon. Fr Matthew participate to Youth World Day in Spain. A report of January 2011 states that the Salesians lost about 63.000.00USD from the money paid to the two contractors which didn’t finished the works. Fr. Matthew Udoka obtained a new sum of money and worked very hard, together with Mr. Petersin Toe one of our parishioner expert in building construction and carpentry, who will create later the ERAMITOE CONSTRUTION COMPANY (ECC) INC., to make the stair case of the new School building and to complete the roof. Fr. Larry receives the obedience to be Rector of Lungi in Sierra Leon and Fr. Nicola Ciarapica, which spent twenty two years of his priesthood in Nigeria, is assigned to New Matadi community and arrives in August 2012. He will thake the task to be in charge of Salesian Presence- HIP, Parish Priest, Administrator and in charge of vocations, Fr. Mattew Udoka continues to be DBYC Director and acting as Principal of Mary Help of Christians Catholic School, Second Year Trainee Student Josephat Ike Nwugo. Rector of the Salesians in Monrovia continue to be Rev.Fr. Lionel Xavier. Catechist of HIP continues to be Mr.Michael Sowah Sr., Vice Chairman of HIP Parish Council being Mr. Abel Obarakpor, Vice Principal of MHCS being Mr. Otello S. Williams. Fr Matthew participate to Youth World day in Spain. A great and magnificent celebration is organised in New Matadi when the young Salesian Albert Gibson makes his final Salesian Profession, before to go to make his Theological Studies for priesthood in Rome. Some Aspirants to the Salesian life starts to leave in the mission.,; they join the community in the prayer time table and have some regular lessons. From 29th August to 3rd September Fr. Guillermo Luis Basanes, carries out in the name of the Rector Major, the Extraordinary Visitation to the Salesian Community of Monrovia. In his letter left to the salesians he write: “... the salesian community of Monrovia is in a naturl and gradual process of becoming two independent religious community”. During the year Matadi presence elaborated his different articulated Community life project and a relative economical independence as Father Basanez recommended. Mr. James Perry, Managing Director of J.P.A. Construction agrees to finish the works of MHCCS in 3 months, under the supervision of Fr. Jose Valiplakel the economer of the salesians in Liberia. Meanwhile he was following the elevation of the third floor of the Don Bosco Technical High School in 8th Street and the new Our Lady of Lebanon Church. A new electric pomp of water well is bought and the rusty water pipes repaired so from the main tank the water could reach all the compound. External electrical current line for the night is connected. This has been necessary because Matadi quarter has not yet receiving the National Electric current and there is only a small generator that can generate no more than 2.5 KVA. For movements of Matadi Salesian presence an old Nisan blue pickup has been provided. On July 2013 the Rector Major and his council officially approved the Salesian Presence in Matadi as Salesian House Canonical Erected . Bl. Stephen Sandor, to be beatified in October 2013 was chosen as Patron of the new Community. Fr. Nicola Ciarapica is now Rector-Economer- Parish Priest, Fr. Mattew Udoka is Vice-Retor and Principal of MHCCS, Deacon Raphael Airoboman joins from March 2013 to take help in the DBYC, and in July the Trainee Student James Acheampong takes the tasks of Josephat Nwogu. 3rd March: MHCCS new building with 8 classes, chemistry lab, Library and some offices are completed and inaugurated. The first group of Students completes the grade 12 and take the WAEC national exam. All the student pass the exam and the School Mary Help of Christians is awarded with the third highest results in Liberia! 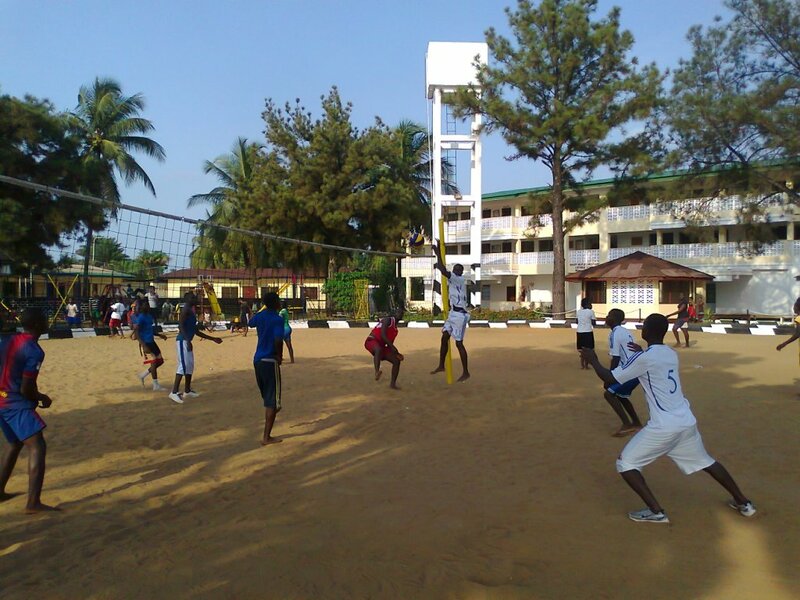 In April 2013 the SYM youths of Liberia – Sierra Leon held their Forum (150 SYM participants) in New Matadi compound. On 6 July 2013 Fr Raphael Airoboman is ordained priest in Lagos- Nigeria and coming back takes the tasks of Youths Director of the Don Bosco Youth Centre-Oratory in Charge. All the electrical underground distribution System is renewed and a Generator of 19 KVA is bought. A blog for web site is open www.donboscoliberia.org. It will be very useful to make the life of the mission known and shared especially with the monthly communication news-letter and the photo-gallery. On February the mother of Sean Devereux returns to visit Liberia and also Matadi. She is received by the Oratorians inside the Multy-purose Hall donated by the NGO Sean Devereux. On March the Ebola Virus enters in North Liberia. The contagious will spread through Liberia and on June will reach the capital Monrovia, only on 2015 Liberia could be free of it, after many efforts and loosing more than 10,000.00 human lives. The school could just finish the academic year, the graduation has been postponed. Fr. Matthew meanwhile is transferred to Ashaiman Ghana. At the beginning of August Fr. Solomon Gbaki, who is ordained priest in Sierra Leon on 18th July, joins the Mission. He takes the task of Principal of Mary Help of Christians Catholic School. The beginning of the school academic year is moved to 2015 because of the emergency polices to face the Ebola Virus. It has been possible to organize with enthusiasm the Holiday Camp 2014, in which 9 voluntaries from Poland participate. They had the chance to return to Poland just a few days before the closing of the airport and the 3 months emergencies polices would be issued. The priestly ordinations of Deacon Albert Gibson planned for the second half of August has been cancelled and rescheduled to new date to be communicated. From November 2014 Fr. Airboman Raphael accepts the task to be Parish Priest as he continues to be in charge of the DBYC. As vice-chairman of Holy Innocents Parish, is chosen Mr. Fernando Gbozuah. James Acheampong is doing his second year as practical Trainee, doing his service expecially in animating the DBYC, the 14 Don Bosco clubs throughout and around Monrovia town. SYM Animators of DBYC and HIP CYO are committed in Ebola prevention and Ebola affected people assistance. Generously they organized seminars to be prepared and qualified to inform population how to prevent and defend from Ebola decease, how to take care of the sick. With courage and constancy they visited from house to house the families distributing means and chloride to people even to the families living in the swamp area. By the God protection and by the covering mantle of the Virgin Mary, no one got sick. With the financial help send by the Rector Major has been organized and financed a project to assist with food, health information, prevention, assistance, education 200 students of Matadi and 500 families tied with our Mission. From Salesian Mission New Rochelle USA, we received 2 containers of enriched Rice during 2014 and other 2 Containers in 2015. The Mission organized the distribution to the families most in need to take care of the children. Promoted by Fr Solomon Gbaki the Divine Mercy Devotion starts in HIP Matadi. From November 2014 a chosen group of our collaborators accepted to start the Salesian Cooperator formation journey in Matadi. Daily Adoration to the exposed Blessed Sacrament is introduced in Holy Innocent Parish, and a walking rosary prayer with youths children and adults at 6:00 pm in the afternoon is promoted by a group of Mass Servants. The Sean Devereux Hall is provided with all around shadow to prevent also rain disturbing activities. A cafeteria for MHCCS student is finally roofed as an old near container is transformed in shop selling room. Only at the beginning of the year has been possible to open the registration for the academic year, the classes started in February and ended in July with only one Semester, but was not possible to organize WAEC exam by the Governament. During the year the Vice-Principal Mr. Otello Williams ended his work with Mary help of Christians Catholic School and the Maths teacher and Registrar Mr Peter Mahn is now the Vice-Principal of the School. Emmanuel Ilodigwe a young Salesian from Nigeria who concluded the third year philosophy in Ibadan is appointed to Matadi to do his practical Training. In October is celebrated the Priestly Ordination of Fr. Alfred Gibson the second Liberian Salesian who reached the priesthood. As young boy during the war, he grown up in the DBYC Matadi, being his mother living just back to the Matadi Salesian fence. Reuben Doeyou a young boy who graduated with the first bunch of MHCCS 2013, joins in Ondo-Nigeria the Salesian Pre-novitiate program. He will make his first profession in Sunyani on 8 September 2016. Meanwhile two salesian aspirants: Berrian Androvish and Johnson Patrick are following a program for discernment in Matadi and on September they join the program in Ondo. 50 DBYC SYM Animators and youths of DBYC participate to SYM AFW Youth Forum in Ghana. The Holy Innocents Matadi Foundation get the incorporated is Liberia promote the scholarship program. With the contribution of the Retor Major donation and many others benefactors local and from abroad more than 200 students are subsidies to pay school to complete the basic formation. In Rome, the Fondazione Don Bosco nel Mondo promotes a fund raising for Liberian children affected by Ebola Virus contagious, Orphans, single parent children. Two rooms are constructed and attached to Community house are building, using a space between the HIP Church and the building where the confreres are accommodated. The Community has now a Room for visitors and can also offer a rest room for guest. Fr. Solomon Gbaki launches with success his first CD Album of Songs. In November the Holy Innocent Parish Pastoral Council approve finally the drawing of the restructuring of HIP Church building that will have a large area to accommodate more faithful, an higher roof and ceiling to give more light and air, offices for the Parish, and a perpetual adoration chapel. A memorable day is the visit of the Rector Major Angel Fernadez Artime to Liberia salesians presences and also Matadi. On the morning of the 3rd February the students and Staff participate to the Mass and cultural activities in 8th Street, in the afternoon, at 3:30 PM, arriving in New Matadi he meets a community of families in the swamp area, inaugurates one of the three water wells with manual pomp the Salesian Cooperators have built for the people of the area, and blesses the children. At 4:00 PM he enter solemnly in the DBYC compound and spends more than one hour with the youths, animators, HIP Parishioners, Relatives of the children who beneficiated of the donations of the Rector Major during Ebola crisis. At 6:00 PM he joins the presents to pray the walking rosary and in the Church, he receives the Promise of the 9 first Salesian cooperators in Matadi (Philip Senayon, Abu Patrick, Flomo Jones, Manuel Darious, Nyemah Lee, Sesay Hawa MUnahi, Tefleh Alfred, Toe Elizabeth Angel, Toe Petersin). In the evening he meets with the salesians confreres and the Salesians Cooperators and gives the Good Night. The works restructuring the Church building starts soon after the visit of the Rector Major, meanwhile the congregation will use the Sean Devereux multi-purpose hall to celebrate their sacraments. After the May Marian Month of May, on the feast of the Immaculate Heart of Mary, nine persons, among the parishioners and Don Bosco Youths Centre officially start the ADMA group (Association Devotees of Mary Help of Christians) in Matadi. There is continuity in the accompaniment of the Salesians vocations and one aspirant Edward Kwame Boateng joins the discernment year in the pre-novitiate of Ondo. In July the SYM DBYC New Matadi President Flomo Jones is chosen to represent the Salesian Liberian Youth to the WYD in Poland. For the first time the Matadi House Annual Plan is prepared with the contribution of a chosen group of our collaborators and the Community Salesian Pastoral Council is formed. September 2016 marks the 25 years anniversary since the first salesians started to operate in New Matadi site. In the annual plan has been decided to make all the year 2016-2017 events under this celebration. The MHCCS is building the room for its Staff and Teachers and a computer room with 24 PC is provided. The Salesian Missions – New Rochelle organization, send a 40 feet container filled with school furniture. In May 6th, the mission celebrated the re-dedication and consecration of the Holy Innocent Parish. The realization of the project has been made possible with the efficient work of animation and motivation of the Parish Priest Fr. Raphael Airoboman. Almost all the expenses have been covered with the local Liberian contributions. Some constructions near the Church building are eliminated to create a courtyard in front of the building and to give a better view. The Parish elects the members of the HIP Parish Council and chooses as new Vice-Chairman Parish Pastoral Council in the person of Mr. Henry Wilson. The Mary Help of Christians Catholic School form a musical band with beautiful uniform and Don Bosco Youth Centre renew its marching band with the contribution of benefactors from USA- Salesian Mission New Rochelle. Holy Innocents Matadi Foundation subsidizes 206 children in the academic year 2016-2017 with the contribution of the money raised with the “Corsa dei Santi 2015 – Fondazione Don Bosco nel Mondo Roma, and many other local and over-see benefactors. In August Fr. Raphael Airoboman is chosen to be Rector of Bl. Sandor New Matadi Community as Fr. Nicola Ciarapica is moving to the Sunyani Novitiate Community. A new salesian priest Rev. Fr. Ephraim Onwuzulu is assigned to complete the Salesian Community.